Lady, That's My Skull: Holiday Special: Invaders from the Ice World! 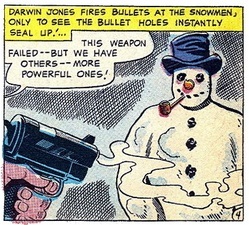 Holiday Special: Invaders from the Ice World! Nothing says Silver Age DC like world conquering aliens from outer space that just so happen to look like buildings, dogs, motor vehicles and even the occasional innocent snowman! 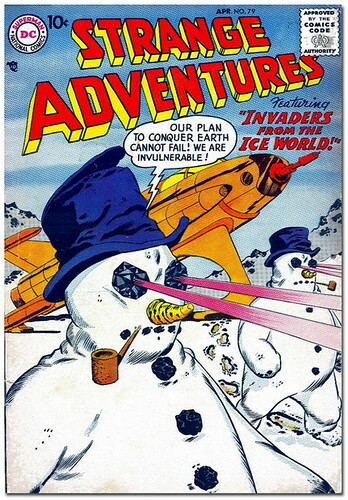 In Strange Adventures #79 (April 1957) the story "Invaders from the Ice World" is an entry typical of that era of DC. It has the familiar plot featuring a generic Science Detective going up against an invading force that uses technology far in advance of Earth, is invulnerable to brute force and atomic weapons, yet who are beaten back by wits, brains and sometimes simple parlor tricks. It isn't a great story but it is serviceable enough and kind of fun. I enjoyed this particular issue more for the bizarre and incredibly awesome cover than anything else. The cover is far superior to the story itself, which is something that happened a lot in comic books, particularly in the Silver Age (check out any 1960s Neal Adams cover for many examples). It is a shame that the realities of today's diminished market doesn't allow a comic book company to just throw out any wacky thing they can and see if it sticks. Back when DC was the clear powerhouse market leader they could do just about anything they wanted and not worry overly much if it failed or not. Their business model was a sort of diversification and it showed in how many titles they launched. If one concept worked out, then great. If not, don't look back and move on to the next idea. One thing that becomes evident in reading these stories is that the aliens of the Silver Age DCU are a superstitious and cowardly lot and only invade a world they can easily defeat by using their advanced and terrifying science. 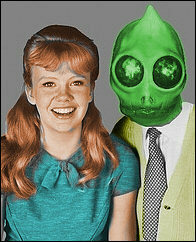 Aliens never try to seduce a population with ideology but rather just exploit American cold war fears. Every time they come up against the least amount of resistance they flee our part of the galaxy, never to return. 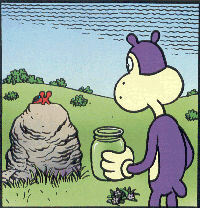 Read Invaders from the Ice World by laying a finger on the brim of the picture below! Wow, that is one wicked cool cover. That story is ever bit as awesome as when I first read it. Evil snowpeople - sheer genius! Sure publishers can no longer "just throw out any wacky thing they can and see if it sticks". That's what the Internet is for now. We've got our own golden age going, so be sure to take plenty of notes so you can harangue your grandkids. "You little punks ain't got nothing like Seanbaby and Angry Videogame Nerd!" Time Travelin' Schatzi's Happy New Year! My Love #10 - No Man Is My Master!